Gilfre is an Imperial lumberjack and the owner of Mixwater Mill. 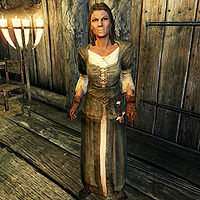 The civil war recently drew her five assistants off to fight, which means she will buy firewood herself, and will also sell lumber if the Hearthfire add-on is installed. If her disposition is raised high enough, she will become a potential candidate for marriage and will also allow you to cut your own lumber for free. The whole mill is in a state of disarray, but Gilfre tries her best to keep it going. She wakes up every morning at 8am and immediately heads out to the mill, lifting and loading the giant logs of timber by herself. She keeps going for a whopping fourteen hours, interrupted only by a two-hour lunch inside her house at 2pm. She finally stops working at 10pm and enters the house for a bit of relaxation before her bedtime at midnight. She wears a set of farm clothes with boots and gloves. She carries an iron dagger, the house key, and a selection of common items and gold. When approached she will openly complain about the men who left her alone at the mill: "I used to have five good men who worked the mill with me. Then this war started and they all ran off. Idiots with mead in their blood." and "There's plenty of good wood around here, but I just can't harvest it all by myself. Everyone able-bodied is fighting." She will also point out the irony of it all: "Of course, without functioning mills, who will make the arrows for our soldiers? Men have no sense of irony." This page was last modified on 12 January 2014, at 09:07.